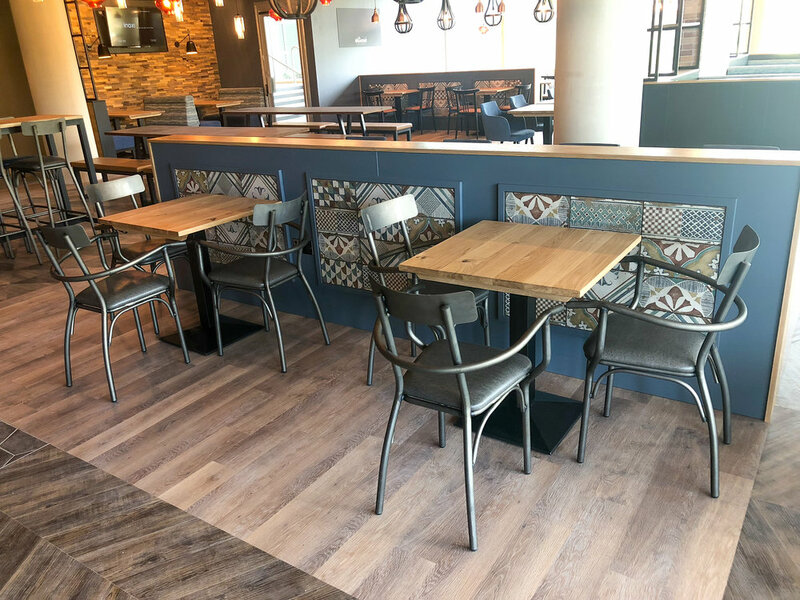 Working closely with the designer, HF procured and manufactured a substantial portion of the interior fixtures, fittings and furniture for the newly launched site at the University of Northampton, on the Waterside Campus. Throughout the project we expanded on our usual skill set and provided specially crafted results, manufacturing bespoke benches and character oak table tops in-house. Procuring chairs/tables, lighting and tiling. We utilised our strong supplier relationships with both UK based and European companies. An interesting accent to this project was the signage and vinyl package that we supplied as the initial focal point for customers. Creating the illuminated signage box and standoff signs required us to carefully consider the importance of clear and concise visuals when communicating with the viewer.